If the tag specifically calls for no iron or a cool iron it’s most likely because the material will discolor under high heat. Sometimes the discoloration is temporary. Other times it’s permanent. If you have a project you really want to do and you’re willing to run the risk of irreversibly ruining the item, it’s best to have at least one duplicate item as a back up. However, if you’re in a pinch, you can test press an inconspicuous area of the garment like inside on the back. Note the darker box shapes left behind from the carrier after pressing with high heat. Did you know most iron settings are actually a range of temperatures? When you hear the little tick from the iron you know you’ve reached the highest temperature in your setting and it will cycle back down to the lowest temperature in the setting. For most projects the variance in temperatures is not a problem, but when working with heat sensitive fabrics the regulated, accurate temperature on a heat press is your best bet. Additionally, achieving proper pressure with your home iron is not as accurate as a heat press. Proper pressure is important for every project, but especially when we’ll be reducing another part of the application process. Which brings me to tip #3! The great thing about Siser materials is that most of them can be applied at the low temperature of 280°F! Many competitor materials require higher temperatures that restrict your application options. Our heat application settings, listed on the Siser website and App, are what we suggest for best application, but they can be adjusted to fit your project. There’s still a chance the material won’t react well to the heat, but that’s why having an extra to spare is tip #1! Since we’ve lowered the temperature we need to increase the amount of time the material receives heat. This will help fully set the heat transfer vinyl. StripFlock® typically takes 15-20 seconds so I pressed for 25-30 seconds. StripFlock requires you to wait until the carrier sheet is cool before peeling it. You’ll feel some resistance as you peel. That’s normal due to the fuzzy texture releasing from the pressure sensitive carrier. We always recommend a heat transfer cover sheet for all your presses. However this heat barrier is especially important when pressing heat sensitive materials. Heat transfer cover sheets offer delicate textiles a layer of protection from the hot upper platen. If you don’t have a cover sheet you can use parchment paper or the shiny side of multipurpose paper. With these few tips in mind you can create awesome projects with Siser HTV like this cute birds in flight scarf! If you have any questions about this post please leave them in the comments! Can you put Siser Easy Weed Transfer material on a Burlap Banner? I am using an iron to do this and do I need to use a Siser Heat Press Multipurpose Cover Sheet? Hi Denise, yes EasyWeed heat transfer vinyl can be applied to burlap! Set your iron to “Cotton” and press for 20-30 seconds. If any HTV lifts as you peel the carrier, lay it back down and press for another 10 seconds. If you don’t have a heat transfer cover sheet or multipurpose paper you can use parchment paper or a clean pressing cloth like some scrap cotton. Can you put Siser Easy Weed on a rayon banner? I have a heat press. Absolutely! You can follow the standard suggested time and temp, however, keep in mind rayon may discolor from the high heat. can you put siser easy weed on a 92% nylon 2% spandex swimsuit? Hi Eddie! For a swimswuit that’s 92% nylon 2% spandex, you’ll need EasyWeed Extra to be able to adhere to the nylon. I have a female blouse that is 95% Rayon and 5% Spandex. Would ColorPrint Extra work for this material? If so, what would be the recommended settings? Jose, ColorPrint Extra will work, but it’s not necessary for rayon. You could use ColorPrint Easy with the standard application settings. I have a shirt that I want to add a logo to that is 100% Rayon – what HTV would i need to use and at what temp? Kelsie, you can use whichever HTV you like best with it’s standard application settings. Hi there, could I use holographic HTV on a 95% rayon 5% tank top. Hi Jennifer! Yes, you can use Holographic and our suggested application settings. If your tank top is very stretchy, press cautiously since Holographic HTV is more rigid than others. To prevent puckering from the pulling/stretching of the rayon, make sure the tank top is relaxed (not stretched out) when applying Holographic. I have a Ponte Fabric Skirt (65% Ray 30% Nylon 5% Span) What HTV would work best as it has a four way stretch and is a tri blend? Thanks! Hi Maria! EasyWeed Stretch would be your best option. Hi! My friend asked me to personalize her. Ridesmaid robes that are made of silk. Can I do that? What material would work best? How high should the temperature be and how long to press. Thank you! Hi Joann! Check the tag of the robes. If it says “cool iron only” or “do not iron” it’s likely that they may be heat sensitive. You can use whichever HTV you please, but you may want to lower your temperature to 280°F and press for a longer amount like 15-20 seconds. I have a friend who send me a shirt she wants glitter htv applied to. I’ve made lots of shirts, but she sent me a shirt that is 95% rayon and 5% spandex. I’ve never applied htv/glitter htv to a blend like this. I’m worried about scorching the shirt. Do I need to lower the temp of my heat press, and if so, what the lowest temp I can use for the glitter to adhere? Hi Megan! To avoid scorching the shirt, lower your heat press temperature to 280°F (this is the lowest temperature we recommend) and increase your pressing time to 15-20 seconds. Hello! I was wanting to personalize robes for my bridesmaids for my wedding with glitter vinyl, I can pick either silk or rayon for the material? Would you recommend one over the other, and would I be able to use a home iron with possibly a cover sheet or a cotton barrier? Hi Ann! Silk and rayon are both considered heat sensitive fabrics, so that choice is up to your personal preference. Either way, you’ll want to use a low setting on your iron and press until you can peel the clear carrier without lifting the HTV. A cover sheet or cotton cloth/towel/pillow case will be suitable as a heat barrier between the iron and HTV. Is it possible to apply Siser glitter flake to a product that is 92% Micro Spandex and 8% Spandex? If so what Time and Temperature for a heat press? also Easy weed stretch same material. Machelle, while it’s possible to apply Glitter HTV and EasyWeed® Stretch to 92% poly 8% spandex keep in mind the Glitter will not stretch with the spandex. With a high percentage of polyester, it’s likely the material is heat sensitive. To avoid harming the fabric, lower the temperature to about 280°F and add 5-10 seconds extra pressing time to the Glitter and EasyWeed™Stretch. Can I use regular easyweed on 92% micro polyester and 8% spandex? it does say do not iron however i have put HTV on my daughters gymnastics leo’s in the past. Thoughts? Hi Tracy, I would recommend using the lower temperature and longer pressing time mentioned in this post for best results. If the tag says “do not iron” it’s very likely heat sensitive. Additionally if you’re able to, use EasyWeed® Stretch. It will perform better on the spandex blend. Can I tie dye a shirt AFTER applying your foil HTV? Making Koozies out of that Neoprene stuff (like every can Koozie) what temp with a heat press and how long??? For neoprene koozies, you can follow our time and temp recommendations for the the type of HTV you’re using, which can be found on our website or the Siser App. Additionally, you may want to check out my How to Heat Press Can Koozies blog post for a full tutorial. Shalon, HTV is not recommended for decorating hard surfaces or ceramics. Permanent sign vinyl would be best for those types of projects. We will have our own brand of sign vinyl, called EasyPSV, soon! Yup, Stephanie, those will work fine! You’ve got the right idea following the lower heat and test pressing the polyester. Hi Sheryl! EasyWeed® Extra is the only Siser® HTV that can be applied to nylon. If the nylon melted then it is heat sensitive and will need a lower temperature with a longer pressing time to apply HTV. Hi i am trying to personalise satin robes i have done many with plain htv glitter and foil but lately i am finding the vinyl is lifting afterwards that is before washing so im wondering if you can give me some advice on why this may be happening my setting on my heat press is usually 120 140 150 15 sec 20 sec 25 sec ive tried them all . i just cant understand why it is lifting after a day are two . Hi Shauna, the lowest temperature we recommend using is 270°F otherwise the HTV does not get enough heat to bond properly. Try pressing at 270°F for 15 seconds. If the vinyl still lifts, press for 5 second increments until fully applied. This method will help determine the best time setting for the robes. Hello, would any specific HTV work for a mesh tie back headband, 90% polyester and 10% spandex. It is like a dri fit tennis headband. Thank you! Hi Heather! I’d recommend EasyWeed® Stretch since the headband has more than 5% spandex for best results. I have a North Face jacket to apply some HTV to. It is 93% Polyester & 7% Elastane. Will regular Easyweed work? Easyweed Stretch OR EW Extra possibly? Regular EasyWeed® will do fine on that blend. EasyWeed® Stretch will work as well, but you do not need EasyWeed® Extra since there isn’t any nylon in the garment. You may want to check out How to Heat Press Fleece for additional tips before you go through with your project. Hello! Can I put htv on an adidas drawstring bag? Hi Samantha! Yes, HTV can go on drawstring bags. Most drawstrings bags are polyester but you’ll want to double check the tag for any indication that the material may melt from high heat. If so, you can follow the tips in this blog post. Otherwise, iron on like usual. Hi Lindsey! Yes, we actually just applied on velvet not too long ago. However, since it’s for a customer I would definitely recommend trying to put heat on an inconspicuous area and see how the velvet fares. Following these tips for heat sensitive items would also be a safe way to get the job done. Hi Erika! With the high amount of polyester and rayon in the garment, I’d recommend pressing at 280°F, since those materials can be heat sensitive. This blog post on heat pressing rayon may be helpful for you. Also, since the garment has spandex I’d suggest EasyWeed® Stretch if you want the graphic to stretch with the fabric. 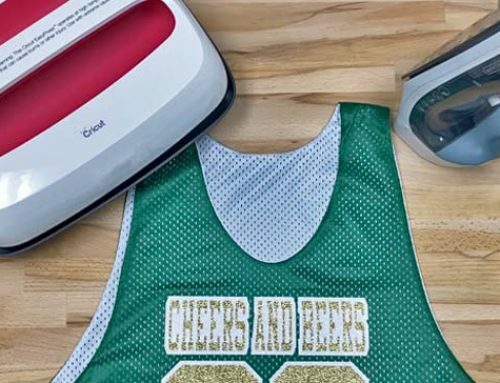 However, I could see how you might want to use Glitter HTV or Holographic (it is a Christmas sweater after all) and luckily all Siser® heat transfer vinyls can be applied at the low temperature of 280°F. When applying at a lower temperature, you’ll have to increase the pressing time, but you’ll still end up with great results! What about Pashmina? I can’t find anything online about htv being used on pashmina. Hi Stacy! Most pashminas are a poly/cotton blend or wool. I’d recommend checking the tag to be certain of the fabric, but regardless any HTV can be applied with regular settings. I have a camo hoodie that is 98% Polyester and 2% Spandex. Am I correct that I need to use Siser Easyweed Stretch and a lower temp of 280 degrees to apply? Hi Sherry! You can use EasyWeed® Stretch, but with such a low percentage of spandex, EasyWeed® will do just as well. It’s up to your preference. 280°F is a safe temperature to apply at, however you’ll need to increase your overall pressing time by 5-10 seconds. If you’d like to apply HTV with the standard time and temperature settings you can always heat apply an inconspicuous area of the garment and see how it reacts to the high heat. If no discoloring or melting occurs, then you can go ahead with the regular time and temperature. I looking to apply htv to a poly china silk, not sure which to use and the time and temp to use. Hi Scott! Being a blend of two heat sensitive fabrics (polyester and silk) I’d highly suggest pressing the fabric at a low temperature of even 270°-275°. This will prevent possible scorching or melting of the material. However with a lower temperature comes a longer pressing time. Add 10-15 extra seconds to the recommended pressing time of whichever HTV you choose. 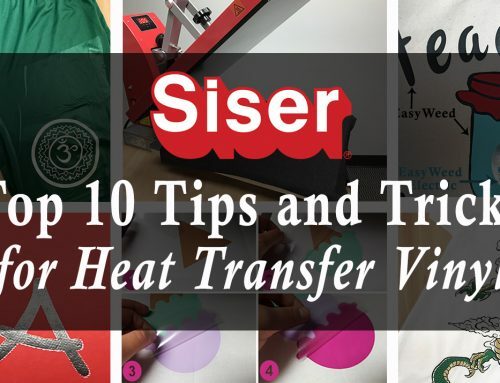 The best thing about Siser HTV is pretty much all of them can be adjusted to this method for heat application. So really you could use any kind of EasyWeed, Glitter, Holographic, etc. Can easyweed heat transfer be applied to a life jacket / vest (Evoprene material)? Hi Diane! We’ve applied HTV to neoprene life jackets and Evoprene is relatively similar. I would still follow the tips in this blog post if you only have 1 to decorate just to be safe. If you can use an extra as a tester then that would be ideal. Hello, can I apply Htv on a shirt 65% nylon & 35% polyester? What are the steps…thank you☺? Hi Claudia! Any garment containing nylon can be decorated with HTV, but you must use EasyWeed Extra as your base layer for it to stick. However, since nylon and polyester can be heat sensitive I’d suggest testing the fabric to see how it reacts. If you don’t have an extra shirt to test press at the standard suggested application settings, then use a low temperature like 280°F and higher pressing time like 15-20 seconds for best results. Hi, I have a navy blue batting jacket to put a pocket size logo on. It says it is 100% polyester but also states on an attached tag that is is wind and waterproof which makes me think it is a coated polyester. I have cut the design from siser easyweed but hesitated when I thought about them being coated. Suggestions? Hi Chris! To test for a waterproof coating, sprinkle a little water on the fabric. If the water absorbs then EasyWeed® will stick. If the water forms beads then the polyester is coated and will need to be removed in the area you plan to decorate with HTV. The coating can be removed with an HTV remover like methylene chloride, just be sure to let the area dry completely before heat applying. Chantel, EasyWeed® Stretch would be your best choice, but EasyWeed® will work too. The “cotton” setting on your iron should be suitable. Check out this video for more iron on tips. What HTV would you recommend for a white 100% polyester jacket with inside mesh/vent lining and at what heat press setting? Thank you. Hi Myrna, any of our HTV’s can be applied to 100% polyester. If you don’t have an extra garment to test the standard suggested application settings, then I’d go with the lower temperature of 280°F and add 5-10 seconds pressing time just to be on the safe side. Hi what would you recommend for 74% Polyester 26%Viscose shirts. (Will also be washed a lot as they’re soccer jerseys). I use a heat press, but never used these type of shirts. Hi Kaleb! EasyWeed® or EasyWeed® Stretch would both be suitable. If they’re particularly stretchy garments, I’d go with EasyWeed Stretch, but just remember Stretch likes a little firmer pressure than standard EasyWeed. Another cost effective option that’s durable would be CADFlex. Ive been asked to put a school logo on blankets, they are 100% waterproof polyester with an oxford backing. is this possible? Hi Heather! I’d try decorating the oxford side, since the waterproof coating would have to be removed from the polyester. If the HTV doesn’t stick after pressing, there may still be a coating interfering. An HTV remover like methylene chloride can be used to remove the coating from the application area. If you can get your hands on a blanket to test, I’d definitely recommend trying out these methods first to see what works best for you. What is the lowest temperature that the glitter HTV can be applied at? Having issues with scorch marks on some sweatshirts when applying the glitter HTV. Hi Cori! We recommend applying Glitter HTV no lower than 280°F. It can be applied at a lower temperature but the pressing time becomes quite lengthy. With Bridesmaids robes 98% polyester and 2% spandex can I apply HTV initials using a heat press? Yes! You may be able to use the standard recommended temperature and time settings depending on how sensitive the polyester is. I’d suggest heat pressing a bit of the robe to see how it reacts to the higher heat. If any discoloring occurs, then use the application method described in this blog post, otherwise you’re good to go! Can I put Easyweed on a Non-Woven Polypropylene using the lower temp settings? Sure can, Melissa! We actually decorate the same kind of bags with EasyWeed as show giveaways. When we make ours the heat press is set to 270°F with medium pressure. A 10 second press is usually sufficient, but we’ll tack on another 5 if there is any lifting HTV. I have shirts to put logo on. What type of htv should I use on 100% polyester and then one is 62% polyester, 33% rayon, 5% spandex, and one is 91% polyester, 9% spandex. Thanks for your help. Hi Betty, the 100% polyester is fine for any Siser® heat transfer vinyl, although our most popular are EasyWeed and Glitter. Since the other shirts have spandex in them, I’d suggest EasyWeed Stretch for best results. Although, regular EasyWeed could still be applied. Can you apply HTV to 13 oz banner material? I have EasyWeed. Hi Susan! A 13 oz banner may melt even at a low application temperature of 270-280°F. Instead of HTV, I’d suggest using EasyPSV™ Permanent which is an adhesive vinyl. HI Lily – I love your projects! I have been asked to customize the sleeves of some performance wear shirts that are 60% Nylon, 37% Polyester and 3% x-static nylon. Can you recommend which Siser HTV product I should use? Thanks! Hi Jodi! Thanks for reading 🙂 Since the garment contains a high percentage of nylon you’ll definitely need to use EasyWeed Extra for the HTV to stick. The adhesive on our other EasyWeed products just won’t cut it when it comes to nylon. However, you can layer other EasyWeed products on top of EasyWeed Extra if you need to use a color that isn’t offered in the EasyWeed Extra line. Which recommended brand of EasyWeed should be used for women’s swimwear consisting of 82% Nylon and 18% Spandex? Hi Abby! Nylon always requires EasyWeed® Extra. Please be aware though, that consistent exposure to chlorine over time will cause the HTV to become brittle sooner than usual. Hi Susan, since microfiber has a low pile, you could use any kind of EasyWeed® product or even Glitter HTV if you wanted to. I’d suggest double checking the tag though to see if there’s any clues it will be heat sensitive. If you have an extra, try pressing it at the recommended settings, and if the fabric discolors, use the application method described in this post. Thank you so much! I used 8 different colors on a shirt that was 95% polyester, 5% spandex – a Lularoe shirt. It clearly stated not to use an iron or I would be “really sad”. It came out GORGEOUS…didn’t damage the shirt at all. Hi Justin! EasyWeed® Extra is actually no thicker than regular EasyWeed. Extra just has a super strength adhesive for nylon fabrics. When pressing on mesh jerseys, regular EasyWeed or even Stretch will do nicely. Just make sure to place a heat transfer pillow inside the shirt to prevent adhesive leaking through the mesh and bonding the sides of the shirt together. Hi Mandy! Yes, HTV can be applied to yard flags. However, you’ll want to use EasyWeed® Extra, since your flag contains nylon. Standard EasyWeed won’t stick. Additionally, the constant exposure to outdoor elements can cause the HTV to wear quicker, but this will also depend on your climate. For heat application, I’d suggest using the low temperature of 275-280°F with medium pressure, and a pressing time of 20-25 seconds to avoid melting the polyester/nylon blend. Hello! Yes, HTV can be applied to chiffon. However, the fabric is likely heat sensitive so you’ll want to use a lower setting on your iron and increase your pressing time in order to apply the HTV without harming the chiffon. I have a customer that wants htv applied to a couple of microfiber pillows. They dont have any tags on them, nor do the cases come off. Is it safe to apply? I dont want to risk ruining their pillows. Hi Shelli! Hmm, that sounds like it could be risky business. I would definitely use a low temperature setting (270°F or the Polyester setting on an iron) and try to test press a small area with just the heating element (no HTV yet.) If the fabric isn’t harmed then you should be safe to apply the heat transfer vinyl. I have a customer who requested a monogram on Ruffle Girl capri set. The material is 95% cotton and 5% spandex. What heat setting do you recommend on a heat press? Hey Jeri 🙂 Cotton can handle our recommended settings for any HTV. For example, you could use any product from the EasyWeed® line which applies at 305°F or you could use products that apply at 320°F like Glitter and Holographic. When decorating cotton, the HTV product (and not the fabric) dictates the application temperature. I would like to use EasyWeed Extra on 87% Nylon / 13% Spandex pants. I see this is the right HTV for the job. I’m wondering since you advise using it on swimsuits and other stretchy materials, does it have any stretch to it? Can I use large designs or should they be small so the surrounding materials can stretch? Hi Karen! EasyWeed® Extra is similar to standard EasyWeed when it comes to the amount of stretch and elasticity in the material. If you make large designs, I’d suggest breaking apart your artwork as much as possible (avoid large chunks of HTV in the design) to allow for more stretch. This will also create a softer hand on the garment and avoids the “plastic sticker” feeling some attribute to vinyl. What is the best HTV for outdoor polyester flags? Hi Marie! EasyWeed® Extra has the strongest adhesive for outdoor applications. Other EasyWeed products can be layered on top for more color possibilities. However, please be aware that HTV is not intended for consistent exposure to the outdoor elements, and the longevity can be negatively effected. I’m am trying to apply HTV to the material of an Easy Up tent. The material is 420D UV polyester. I’ve read a lot of comments about lowering the temp for polyester in general so with doing that, should it adhere to it? Will the UV part of it affect it at all? Also, what would be the best type of HTV to use for it? Hi, Laura thanks for reading! As long as you increase your pressing time the HTV will adhere when using a lower temperature. However, the UV coating may need to be removed with methylene chloride in the area you want to decorate for it to stick. Please keep in mind, that HTV is not intended for outdoor use and consistent exposure to the elements can negatively affect heat transfer vinyl’s longevity. Is there any low temp HTV that I could use with my heat press? Hi Michelle! We don’t have one specific “low temp HTV” however all Siser heat transfer vinyl can be applied at the low temperature of 270-280°F when you increase your pressing time 10-15 seconds. I’m wanting to apply glitter and or regular htv or whatever you suggest to a women’s top that is 58% cotton, 39% modal, 3% spandex jersey. What is the best instructions for applying without scorching or what material should I use to put my graphic design on it? I also may want to use HeatnBond on material with the htv. What advice do you have for using cotton material with the htv? Hi Julia! I’d suggest reading this blog post since Modal is similar to rayon. You could use any HTV at 270-280°F and add 5-10 seconds to your pressing time. If the shirt is very stretchy, EasyWeed® Stretch will give the best results. As for the cotton and the HeatnBond, the standard application settings for the HTV you choose will be fine for those materials. Hi Lilly, I’m making bridal t-shirts and wondered how htv would holdcup on 95% modal polyester and 5% spandex? There’s quite a few areas on the shirts that will have glitter also. Any feedback would be greatly appreciated! Hi Joanne! Glitter HTV will adhere to a modal polyester/spandex blend. However, keep in mind that the HTV doesn’t have a lot of stretch to it, so if you’re doing full front chest designs, you may want to go up a size on the shirts. Additionally, the fabric is likely heat sensitive. You can check by applying heat with your iron/heat press on an inconspicuous area of the shirt. The test will help you decide if you should stick with the standard recommended application settings, or if you should use the method mentioned in this post. Hi would you happen to know if I can apply the glitter htv to a 100% polyester t-shirt? Hi Crystal! Glitter HTV will have no problem sticking to polyester. You may want to double check the polyester for heat sensitivity before decorating though. Use your iron/heat press to apply heat to an inconspicuous area of the shirt and see how the fabric reacts. The test will help you decide if you should stick with the standard recommended application settings, or if you should use the method mentioned in this post. Thank you! I will check & see. Hi Lily … You are a Godsend with all of your great advice !!! I checked to make sure I wasn’t asking a previously covered question (hope I didn’t miss it 😀 ) …. My question: I want to decorate some Swing Tops that are 55% Poly, 40% Rayon, and 5% Spandex. Can this be done … and what type of HTV for best results, temperature and time? …. Thank you so much !!! Thanks for reading, Juanita! For your tops, EasyWeed® Stretch will give best results on a stretchy blend like that. This blog post goes over how to heat press rayon with Stretch and may be helpful to you. Make sure to use firm pressure with Stretch and you may need to use a lower temperature like 280°F and increase your pressing time to 15-20 seconds in order to avoid heat marks on the fabric. I am getting ready to use Siser HTV on UnderArmor dry fit shirts for the first time. I am nervous because the shirts are so expensive, I cannot afford to mess up! (I am used to doing triblend and cotton shirts at 320 for 20 seconds on my heat press and then pressing again after peeling for 10 more seconds or until I see the fibers of the fabric through the transfer.) For this 100% poly, what temp works best and for how long? How will I know it has adhered well? Hi Tina! I would suggest erring on the side of caution with your Under Armor garments by using a lower temperature setting like 280°F. Press for 15-20 seconds and then you can peel the carrier. An additional press after that is not necessary unless some of the vinyl is visibly lifting. You may want to watch this video that explains why seeing the weave of the fabric through HTV is not actually the best practice. Hope that helps, and good luck with your project! What type of HTV would be best for velvet wine bags? Hi Sharon! I decorated some mini velvet bags in this post with several different kinds of HTV. It’s really up to your preference since they all will adhere. Just keep in mind that the velvet texture may show throw the thinner vinyls (like EasyWeed and Stretch) but using a thicker or textured vinyl (ie Glitter, Holographic, StripFlock) will hide the velvet texture. Hi Stephanie! Siser heat transfer vinyls adhere to many fabric blends, however if the fabric is a nylon blend then you must use EasyWeed Extra for it to stick. Please keep in consideration though, that Siser heat transfer vinyl is not flame resistant or retardant. Hi , I have a shirt that is air dry and 100% polyester. Can you put HTV on it and us the heat press? Hi Kathy! If the garment tag says “air dry” or “cool iron” it’s likely heat sensitive. You can still decorate it with HTV, but I’d suggest using the method in this post (lower temperature and increased pressing time.) You’ll still get great results using this method, especially with a heat press. Hello! I have someone wants glitter HTV put on a 100% Polyester with Polyurethane coating backpack. Is it safe to use following the lower heat method? Hi Stephanie! Yes, the lower heat method will work with that type of backpack. You may want to test press a small piece of Glitter HTV on an inconspicuous area of the backpack to see if the 15-20 second press time is sufficient. Since Glitter is a thicker HTV you may need to press for another 5 seconds. Yes, you can! You will need EasyWeed Extra since it’s made specifically for decorating nylon. Other heat transfer vinyls don’t stick to nylon. Hi Reanna! Since you only have one shot at it, I’d definitely stick with the lower temp method. Some 100% polyester isn’t negativity effected from the heat, but in your case it would be best to be cautious. Lowering your temperature and increasing your pressing time will do the trick. Good luck with your project! Hello, I have a set of Micro suede pillows, which settings do you recommend or is this even doable? Hi Megan! We’ve applied EasyWeed® HTV to micro suede before. However, this fabric can vary in heat sensitivity. If you can, test press an inconspicuous area or extra pillow to see how your suede reacts to 305°F. If you don’t have an extra to spare, I’d suggest erring on the side of caution and using the 280°F and 15-20 second application method in this post. I have a tube towel which is microfiber suede blend of 70% polyester and 30% polyamide. Can I put HTV on this with a Heat Press and if so what temp setting should I use? Hi Debbie! Since polyamide has nylon in it, you’ll need to use EasyWeed® Extra to decorate the tube towel. It would be best if you had an extra towel to test press with the standard application settings. Otherwise, I’d suggest using the low temp application method outlined in this post. Can I add regular htv to a quilted bag? I wasn’t sure what it would do on the seams. Its a large logo. Hi Brittney! Yes, you can, but I’d recommend using a heat transfer pillow under the quilting to even out the pressure . With a pillow, the HTV will be able to adhere to the seams in the crevice areas. looking to create key chains made of polypropylene webbing belt like material…I see above you can do this on lower temp settings but which Siser product do you recommend? Hi Nikki! EasyWeed® products would do best on polypropylene. Hello What kind of vinyl would work for oxford material. To put on a fanny pack? Hi Jennifer! You can take your pick of HTV to decorate oxford material. Just use the suggested application settings that can be found on the Siser website and app. You will also likely need to use a heat transfer pillow inside the fanny pack in order to have even pressure on the HTV. will this adhere the htv? I tried it on one and it did not stick. Suggestions? or should I use something different? Hi Debra! When applying EasyWeed HTV at 280°F, a pressing time of 20-25 seconds should be sufficient. If the HTV is still not sticking, you may be experiencing a pressure problem. Use a heat transfer pillow to raise the application area above any seams, and try pressing again. Reflective and UV Protection. The setting the heat press was on 275° and pressed for 15 seconds. But I had to press it multiple times because it wasn’t sticking to the material. After the customer went to splash pad the lettering came off. What do I need to do or change to fix the shirt? Amalia, I have forwarded your issue and email address on to our support department. They will be able to help you resolve your issues. Hi Mary! Our tech support says that UV protected garments have not presented issues with application. However, they do caution that UV protected garments are often made of heat sensitive polyester. You may want to use the lower heat method I used in this post unless you know for sure that the fabric is not going to discolor from the standard heat settings. What would the heat press settings be for velvet drawstring ring pouches? Hi Daniel! I decorated some velvet drawstring pouches in this post with the EasyPress. For a heat press, I’d recommend sticking to 305°F and increasing your pressing time by 5 seconds if you’re using a thicker vinyl (like Holographic, StripFlock, or Glitter.) Keep in mind the pressure from the heat press will smash down the velvet fibers during the application process. But they can always be re-fluffed after decorating with HTV and will look good as new! I am doing my first reversible 100% polyester mesh jersey. I will be putting the last names on both sides. What would you recommend for me to use? How long and what temp should I use on it? I’m worried that the fabric will get stuck together through the holes of the jersey. Please help me! Hi Lupita! For a project like this I’d go with EasyWeed. If you’re unable to test press the garment to determine if it’s heat sensitive then I would recommend using the lower temperature method from this post. Bring your heat press temp down to 280° (on a home iron use the polyester or rayon setting) and increase your pressing time 5-10 seconds. To prevent the sides of your jersey sticking together, place a heat transfer pillow within it. If you don’t have a pillow, you can use a folded towel. Thank you so much. One more question, what would you recommend for the wash process? Thank you! One more question. What would you recommend for the washing process? I need to apply HTV to a large space on a shower curtain which is 100% polyester and says Do Not Iron. The polyester is white. I am afraid of any discoloration or harming the material. What do you recommend? How long to press and temperature? Thank you! Hi Dakota! With a large project like that, I’d suggest heat pressing a small inconspicuous area to see how it reacts to the 280°F heat (like I used in this post.) If the fabric seems unaffected, then you should be fine to heat press HTV at 280°F for 20-25 seconds. We used the same method when applying EasyWeed® Stretch to Rayon in this post. hey! I have a tank top that I want to make using Easy Weed Vinyl but the tank is made out of this: 65% Polyester and 35% Viscose. I was wondering if I can use easy weed on this. If so what temperature and time is needed using the heat press? Hi Brooke! Yes, you can use EasyWeed® on a polyester/viscose blend tank top. Viscose is similar to rayon, so I’d suggest using the lower temperature application method from the How to Heat Press Rayon post. Set your heat press to 280°F and press for 15-20 seconds. Hi Sweety! Yes, HTV can be applied to those materials! However, I’d suggest using EasyWeed® Stretch for best results. This blog post shows how to apply EasyWeed® Stretch. Can you put HTV on a mesh (safety) vest? Yes, you can Lorri! But depending on the fabric content you may need to use the lower temperature method from this post. If you know the fabric can withstand the standard heat settings then you can use those. Either way, the most important thing to remember is to place a heat transfer pillow inside (between the two layers of mesh) to prevent the HTV adhesive from sealing the front of the vest to the back. A heat transfer cover sheet or parchment paper inside will do the trick as well. Hi There! I am wanting to use some Glitter JTV on a backpack for my little girl that I am getting from Pottery Barn, it says the material is – Made from rugged, water-resistant 600-denier polyester, will it work on this material and if so, any advise on heat setting and time? Hi Alice! Siser heat transfer vinyl can be applied to 600 denier polyester with the lower temperature method explained in this post (280°F for 15-20 seconds) and you’ll likely want to use a heat transfer pillow or rolled up towel to achieve even pressure. It’s the “water-resistant” bit that may complicate matters. If you’re able to, I’d suggest test pressing EasyWeed® Extra on an inconspicuous area (like the bottom of the bag or inner side of a strap) to see if it will adhere. EasyWeed Extra can decorate most coated fabrics, however if it won’t stick then you’ll have to take a few more steps before decorating the backpack. Watch this video to see how you can decorate waterproof fabrics with Siser HTV. I have a coated canvas tote bag (cotton with a pvc coating) that I would like to customize with HTV. Is this possible? If so, can you please advise regarding time and temperature? I would not want to melt the coating. Thank you! Hi Kelly! With a PVC coating, you do have the possibility of melting the material. I would suggest using the lower temperature method from this post (280°F for 15-20 seconds) and heat applying a small area to see how the fabric reacts before pressing your full design. I have a shirt that is 95% rayon, 5% spandex will siser metal work ok on this shirt as long as I use a lower temperature? Thanks. Can I applu HTV to a school backpack made of 100% polyester? For applying to gymnastics leotards that are shiny and are Body: 85% Nylon and 15% Spandex, Lining: 95% Polyester 5% Spandex, doesn’t mention no iron but says no dry cleaning. Can I use Easyweed Stretch to apply a team logo without having it come off? Hi Sarah! Unfortunately, since the fabric has a high nylon content, EasyWeed® Stretch is not going to be suitable. EasyWeed Extra will adhere to the fabric, but it is not going to stretch with the spandex. If you’d still like to decorate the leotard, I’d suggesting heating a small area to see if the recommended 305°F has any negative affects. If so, use the lower temp method (280°F for 15-20 seconds) in this post. I have been asked to put vinyl on color guard flags (for marching band). The material looks to be China silk (polyester). Can you recommend a vinyl that would work best with this? The flags will be whipped around a lot, so I am not sure if anything will really stick on there. I would like to print a logo on some life jackets. The material is 400 denier nylon fabric. I have regular Siser Easyweed vinyl. Is this an acceptable transfer to use on these life jackets? Thanks so much! Hi Leah! Nylon can only be decorated with EasyWeed® Extra. The adhesive on standard EasyWeed® will not stick to nylon. However, you can layer EasyWeed on top of EasyWeed Extra for more color options. Hello… I’m wanting to know if you can use Siser HTV on smooth outdoor banner material? I understand I would had to use my heat transfer cover sheet during application, and would have to press in sections. I’ve been looking through past comments here, but couldn’t find this question. Hi Donna! If your banner material feels like plastic or vinyl then I’d suggest using EasyPSV™ Permanent since it’s made to withstand exposure to sun and other outdoor elements unlike heat transfer vinyl. If this is not the type of banner you have, please let me know the fiber content of the material so I can best advise you. Thanks for reading the Siser Blog! Hi Tosha! Yes, you can decorate a lunch box with with Siser HTV. However, since the fabric is coated you’ll either need to use EasyWeed® Extra or follow the steps in this video to remove the waterproof coating on the application area in order to decorate with EasyWeed®. Also keep in mind that you’ll need to use the lower temp method when applying HTV to ensure the cooler liner doesn’t melt. hello! I am getting ready to do some business shirts with their logo on the back of the shirt. It’s a pool company so they are outdoors and in the sun a lot. I am trying to find the best htv that can withstand the weather the best. The shirts are 100% micro-polyester. thanks!! Hi Rachel! You can use EasyWeed® on 100% micro-polyester, but unfortunately no matter the HTV you choose, they’ll all eventually break down from the sun exposure. Contact with chlorine will also negatively affect the vinyl’s longevity. I’d recommend hang drying to prolong the life of the garment. I just applied an Easy Weed Glitter to a sweatshirt with an iron. It was my first time, and i fear I didn’t heat it long enough. I seem to fear that I will melt it. Is it possible to go back and “re-heat” it with a silicone cover? It hasn’t been worn or washed yet. Hi LeAnne! Yes, you can go back and re-press areas that are not stuck down. I’d recommend pressing 5 seconds at a time with a cover sheet on top of the HTV. However, if you followed all the heat application instructions and the Glitter isn’t noticeably lifting away from the fabric, you should be safe to wash it. You can always go back after washing and re-press any area that may have lifted. What is mesh material in shoes? It can be made from polypropylene, polyethylene, nylon, PVC or PTFE. A metal mesh may be woven, knitted, welded, expanded, photo-chemically etched or electroformed (screen filter) from steel or other metals. In clothing, mesh is loosely woven or knitted fabric that has a large number of closely spaced holes. So I’m not sure what the mesh is made of. I cannot afford to buy a practice pair of shoes, but am open to your suggestions. Hi Shirley! If the mesh is nylon or coated, then it’s possible the Glitter HTV will not stick. The only HTV that sticks to coated fabrics and nylon is EasyWeed® Extra. 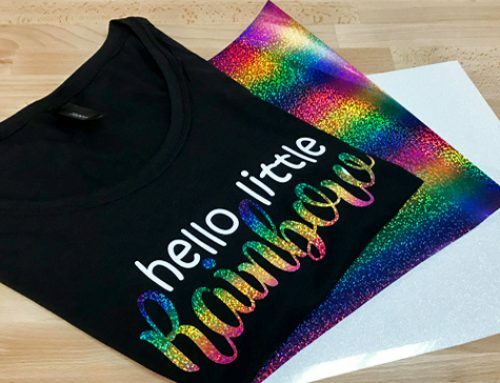 If you’d still like to try it, I’d use the setting a step or 2 below Cotton on your iron, stuff the shoes with a heat transfer pillow, and use some kind of heat safe tape to keep your Glitter HTV in place while pressing. A heat transfer cover sheet of some kind is definitely necessary, and you’ll need to be cautious to avoid melting the rubber soles. You may want consider using a small craft iron for this project. Good luck! Lily!! I have a customer with a 60/40 rayon-poly t-shirt and she wants glitter and regular HTV on it. Would the 280 F for 15-20 sec work for that blend? I presume I would do the matte black easy weed before the glitter correct? Thank you in advance! Kellie, you got it girl! I’d suggest your heat application process goes like this: Tack EasyWeed for 1-5 seconds with cover sheet. Hot peel carrier. Tack Glitter for 1-5 seconds with cover sheet. Warm peel carrier. Replace cover sheet and press for 10-15 seconds. And of course this would be at the 280°F temperature like you said! Thank you for all your help….I have read thru most of the above questions and answers and saw nothing on this. Margaret, for the binders, you may want to use our EasyPSV material (http://siserna.com/easypsv) We have many colors and even Glitter and chalkboard that can be applied to hard goods. I’m just afraid that if you try to heat apply the binders that the plastic will melt. Hi Margaret! If the school supplies feel more like paper or cardboard then you can apply HTV on them like you said with the lower temperature method since you don’t want to ruin any of your grandaughter’s supplies. I was able to test apply on the journals I decorated in this video, to determine they weren’t heat sensitive so I was able to use the standard recommended time and temperature for Glitter HTV. However, if the material feels more like plastic or vinyl then you’ll want to use EasyPSV™ which is an adhesive vinyl that doesn’t require heat. I would like to make a garden flag. The material is nylon ( low heat) which Siser vinyl would be recommended? Hi Debra! You’re going to need EasyWeed® Extra to decorate nylon. It’s only offered in limited colors, but as long as it’s the bottom layer, you can layer other types of EasyWeed on top! Hi will glitter Siser HTV apply to 49%modal 48%cotton 3% spandex? Hi Shantel! Yes, Siser Glitter HTV can be applied to modal blends. Modal is similar to rayon, so I’d suggest reading the rayon and EasyWeed Stretch blog post for the best application method that can also be used to apply Glitter on your modal garment. Hello! I’m using a Cricut easy press to attach Siser Glitter HTV. My shirts are a black cotton/poly blend but it looks as though the press is leaving marks/discoloring the shirts. Should I lower the temp? I’m using a teflon sheet between the heat press and the HTV. Thank you! Hi! Yes, if the press is leaving discolored marks on the shirt, you should try lowering the temperature. With a lower temperature, a longer pressing time is necessary, so I’d suggest adding 5-10 additional seconds to the recommended press time. Also, you may want to try using a piece of parchment paper because it doesn’t hold heat like the teflon will. I need to put some HTV on school safety vests that are 100% polyester. The tag says “do not iron” – Is it even possible for me to add HTV to this item? And, if so… do you have suggestions for me? Thank you for your help in advance!! Hi Donna! If the tag says “do not iron” then it’s likely that the fabric is heat sensitive and could possibly melt or discolor when coming in contact with high heat. It may be possible to decorate them with a lower temperature (270-280°F) and a longer pressing time (15-20 seconds). It would be best to have an extra vest you could test apply in order to see how the fabric will react to the heat. Hi there! Any recommendations or experience with applying to a faux suede polyester blend? I’m hoping to use an HTV on some pillows I purchased. Thanks in advance! Hi Hailey! You can decorate faux suede with HTV, however you’ll want to use the lower temperature application method since suede is often heat sensitive. Keep in mind that suede has micro fibers that get smooshed down when applying pressure and heat to the fabric. This is normal and is easily fixed by re-fluffing the fibers with your fingers. Hi, can you please recommend an HTV for a leotard that is 82%Nylon/12% Spandex?? Thank you! Hi Anna! You’ll need to use EasyWeed® Extra since it is the only HTV Siser® offers that will stick to nylon. Extra is offered in limited colors, but you can layer other colors directly on top. Hi, I have a customer asking if we can use vinyl on a flag. Can you press on a flag that is 100% polyester and what would be the best vinyl to use for that project? Thank you! Hi Andrea! All Siser heat transfer vinyls can be applied to 100% polyester, so it’s totally up to your preference! Please note that if the flag is intended for outdoor use, the consistent sun & weather exposure will reduce the HTV’s longevity. Hi, is there any siser vinyl that can be heat pressed onto polypropylene grocery bags? And if so at what temperature would be recommended? Hi Danielle! We press polypropylene bags with EasyWeed® products at 275°F for 15 seconds to avoid melting the bags. Hello! For a polyester acrylic blend, you could use your HTV of choice. If you’re unable to test press an inconspicuous area of the garment to see if the fabric is heat sensitive, then I’d suggest using the lower temperature method: 270-280°F and 15-20 seconds of pressing time. Hi Chris! For the Glitter HTV I’d suggest pressing at 280°F for 15 seconds. However, when it comes to rhinestones I’d suggest reaching out to our authorized Siser distributor, The Rhinestone World, for their time and temp recommendations. They’ve mixed these two materials before, and even have a video on the application here. I have a pillow case that is 100% polyester. I want to put glitter htv on it. What settings do you recommend me trying. Hi Mary! If the polyester pillow case is white then you can use our standard recommended settings for Glitter HTV: 320°F for 10-15 seconds. However, if the pillow case is colored, it could discolor from the high heat of the press. In this case I’d suggest using 275°F for 15-20 seconds. What type htv would you recommend for a 100% vinyl handbag (it looks like a faux leather to me)? And what heat settings should I use, if this is possible? Thanks in advance!! Hi Helen! EasyWeed® or Glitter HTV would likely work best. I’d suggest using a temperature of 270°F and press for a few seconds at a time to prevent melting the bag. The Rhinestone World has a video tutorial on decorating a faux leather purse that would be a similar application process. Hi Monica! No, EasyWeed® heat transfer vinyl is not UV resistant. However, EasyPSV™ is! I have three questions. I am new to vinyling. Sorry for all the questions. #2. If I am pressing with regular Easyweed and Glitter on the same design, not layered, which vinyl recommendations do I go with since they are different vinyls? 305 for 15 seconds or 320 for 15 seconds. #3. If I am pressing a design larger than my press and I move the design over to press the other half of the design, won’t I burn/scorch the vinyl of the half that I have already pressed? I appreciate so much all of the helpful blogs and responses to all the questions posted. It is so helpful to newbies wanting to get started with vinyl. Hi I have a morphsuit my son wants to wear for Halloween and we want to add some vinyl. Its made of polyester, spandex, lycra. What kind of vinyl would this work on?? Hi Marci! With something as stretchy as a morph suit, you’ll definitely want to go with EasyWeed® Stretch. Sharon, EasyWeed Extra is probably your best bet. We recommend 305° for 10-15 seconds but you will definitely want to test a small piece on an inconspicuous place (inside hem maybe). What would be recommended on like a wind breaker material? It says 100% polyester but It feels like a wind breaker. Hi Dustin! As long as the wind breaker doesn’t contain any nylon, you can apply your HTV of choice. Every Nylon and heat sensitive fabric is going to be different. We always recommend testing on an inside hem or somewhere out of the way. You can knock the temperature down to about 280° but increase the time to about 20 seconds. Can I use Siser Easyweed on 300 Denier Oxford polyurethane waterproof material. Hi Angel! Yes, but to apply HTV you’ll need to remove the waterproof coating in the application area. I’d suggest watching this tutorial before giving it a go. Hi. I have mesh basketball jerseys to decorate. What is best Siser material? Will holes show through? Hi Leslie! What is the fabric content of the jersey? Most often they’re polyester, and in that case EasyWeed® is your best choice, but if you want to add some sparkle with Glitter or Holographic- that’s still an option! The key thing to remember when decorating mesh jerseys is to place a heat transfer cover sheet or heat transfer pillow inside the garment (between the front and back of the shirt) to block the warm adhesive and prevent sealing the two side of the garment together. Am I able to use siser easyweed stretch on a 100% nylon jersey? Is so what should I put the temperature and time? Hi Danielle! EasyWeed® Extra is the only Siser® HTV that can be applied to nylon. Our recommended temp and time can be found on our website here. If you wanted to use EasyWeed® Stretch for its limited color offerings, you can layer Stretch on top of Extra. In that case, I’d recommend tacking the first layer for 1-5 seconds and pressing the second layer for 10 seconds. Hello, can you use easyweed HTV on Ripstop Polyester, 210 Denier Polyester or Rilpstop Nylon? Looking to use it on a cinch bag. Hi Kate! You can use EasyWeed® HTV on the polyesters you mentioned, however if you want to apply HTV to nylon you’ll need to use EasyWeed® Extra for it’s extra strength adhesive. How do I avoid scorch marks on performance wear? Also, once they are there, can they be removed? Hi Amy! Unfortunately, scorch marks can not be removed. In the future, they can be avoided by using a low application temperature (270-280°F) for 15-20 seconds. All Siser heat transfer vinyl can be applied at a lower temperature if you use a longer pressing time! If the fabric is very sensitive though, you may want to use parchment paper in place of a teflon cover sheet since the paper doesn’t remain hot after pressing like the teflon will. I am wondering if you can use htv on the fleece robes. I have a customer that wants me to make her a specific design on a robe and since I’ve never done one before I’m not sure how well it will adhere. Any tips or suggestions would be greatly appreciated. Hi Joanne! Fleece is usually polyester and all Siser® heat transfer vinyls can be applied to polyester. However, you may want to apply heat to an inconspicuous area of the robe to ensure it’s not heat sensitive. If the fabric has any negative affects then I’d recommend using the lower heat method from this post, otherwise you can use the standard application. Also, please keep in mind the that fleece’s pile can vary. The larger the pile, the more likely you’ll see the texture of the fabric through a thin TV, like EasyWeed®. You may want to use something thicker like Glitter or StripFlock®. I’d like to make a knitting bag and decorate it, can i put htv on this 600-denier polyester? or am i better off using regular vinyl since i wont be wearing/washing it? Hi Jennifer! For 600-denier polyester, heat transfer vinyl would be your best option. I’d suggest using the low application method (270-280°F for 15-20 seconds) just in case the fabric is heat sensitive. Hi. I have a customer that wants their company name in buffalo plaid on an acrylic vest. The vest has a 100% nylon lining. The tag says to use a cool iron if needed. Is this even possible? Hi Lea! Since the tag says “cool iron only” it’s likely the acrylic is heat sensitive and may melt or discolor. I’d suggest turning your heat down to 270°F and test pressing a small, inconspicuous area of the vest to see how it reacts. It may be possible to apply HTV at this lower temperature for 15-20 seconds, however it’s possible the vest is too sensitive for heat application. Hi Dom! With 100% polyester, you can use any Siser heat transfer vinyl. If you’re able to, test press an inconspicuous area of the jacket at 340°F (this is the temperature we use on the EasyPress for most Siser HTV.) If the polyester shows no heat mark, then you can press the HTV for 10-15 seconds. If there is a heat mark, lower the temperature to 310-320°F and increase your pressing time to 15-20 seconds. Since you’ll be layering though, you can press the first for 1-5 seconds and the second layer for 10-15 seconds to get that 15-20 second total. 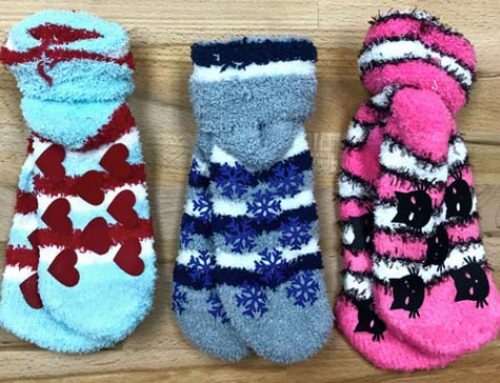 I’m wanting to put HTV on the bottom of socks…I have found some socks that are 35% wool, 35% polyester, 24% cotton & 5% spandex, is ther an htv I can use for that? Hi Robyn! I’d recommend using EasyWeed® Stretch to decorate the bottom of socks. It will stretch the best with the spandex. I have a set of polypropylene drawstring bags that I plan on using for Christmas gifts. Can I use Siser Easyweed HTV to personalize these bags? I was thinking about setting my heat press to 275 degrees and pressing for 20-25 seconds? Hi Hannah! You can decorate polypropylene bags with EasyWeed®. I’d suggest pressing at 275°F for 15-20 seconds for best results. Hi Laura! I’d suggest using EasyWeed® HTV and applying at 280°F for 15-20 seconds. Hi Lilly can you tell me what’s the best Siser HTV for can Koozies? Hi Dawn! EasyWeed® Stretch would be best for koozies, but any Siser HTV will work. Can I use htv on a plastic lined bib? Yes, you can! I used an iron on this bib, but you can use a heat press too. I’d suggest using a heat transfer pillow if using a heat press though, since you can’t target the center like you can with an iron. Hi Lily. I have a decorators fabric that is 100% polyester and has been treated with a flame retardant. We want to make throw pillows with names on them. What is the best vinyl to use for this project and what temperature setting do you recommend with a heat press? Do we need heat protectant paper as well? Thanks so much for any advice you can give! Hi Trish! I’d suggest using EasyWeed® and test pressing a pillow case at 305°F for 10-15 seconds to see if it will have a negative reaction to the heat. If it does, you can use 270-280°F for 15-20 seconds. A heat transfer cover sheet or parchment paper on top of the HTV during pressing is recommended. Hey! Doing silver stretch HTV and the tank is 52% linen and 47% polyester. What settings would I use with an easy press? Hi Jennifer! I’d suggest 340-345°F for 10-15 seconds with very firm pressure. Can i use siser on 100% PU (I suppose that means polyurethane)? If so, temp? Time? Peel? Also, can i use it on a baseball bag that says “Heavy Duty Nylon Rip Stop & 600 100% D Polyester”? And it can handle the heat. And if so, temp, time and peel?. Hi Tara! Siser® HTV can be applied to PU, but it’s possible the material is heat sensitive. I’d suggest test pressing at the standard recommended time and temp for the HTV you want to use. If there’s any negative affects, you’ll need to use the lower heat application method of 270-280°F for 15-20 seconds. Your peel will depend on the HTV you choose to use. For your nylon duffel bag, you’ll need to use EasyWeed® Extra since it’s the only Siser HTV that can be applied to nylon. Additionally, I’d suggest test pressing and possibly using the lower temp application method mentioned above. Hi Lily, Can i apply glitter to a 100% poly brushed tricot? Yes, you can apply Glitter HTV to a polyester brushed tricot. However, I’d suggest checking the garment tag to see if there’s any indication the polyester could be heat sensitive. If it says “cool iron only” or “do not iron”, you’ll need to use the lower heat application method of 270-280°F for 15-20 seconds to avoid scorching. Hi Lily! Can I apply HTV (regular or glitter) to velour? I have an easy press! Hi Audra! Velour is typically made from cotton or polyester so it could be decorated with HTV. I’d suggest double checking the tag on the item to see if there’s any indication it could be heat sensitive, and possible test pressing the fabric at our recommended time & temp for the EasyPress 345°F for 10-15 seconds. If you think it’s heat sensitive, I’d suggest pressing at 305°F for 15-20 seconds. After applying, you’ll likely need to re-fluff the velour fabric that’s been pressed down, and after that you’re all set! Love the product. I use it a lot. I want to try to decorate a scarf/wrap. It’s 100% acrylic and says do not iron. I’ll drop the iron temp on it, but is there anything else I can do? Hi Hickory! Going as low as 270°F is about as much as you can do for acrylic that says “do no iron.” You may want to use parchment paper instead of teflon since the paper lets go of the heat faster, but changing your cover sheet may only make a marginal difference. The temperature is the main factor with heat sensitive fabrics. Hi! I have plans to start using HTV for some costume projects. I was wondering if you knew if the HTV can be applied to a polyurthrene fabric? Like a 2 way stretch spandex with a PU coating? Hi Alyson! Yes, products in the EasyWeed® family can be applied to polyurethane. With a fabric like that, I’d definitely suggest applying at a lower temperature and longer pressing time, 280°F for 15-20 seconds. I was wondering if the easyweed stretch would work on Under Armour heat gear shirts? If it can be used what setting on my heatpress should I use? Hi Micah! Yes, EasyWeed® Stretch can be applied to under armour. I’d suggest 305°F for 15-20 seconds with firm pressure. What type of HTV would you recommend using on flag material? Hi Erin! Without the fabric content of the flag, it’s hard to say which material would be best to use. If the flag is nylon, you’ll have to use EasyWeed® Extra for it’s special adhesive. If the flag is more like a plastic or vinyl, then you may even want to use EasyPSV™ Permanent, which is made to endure outdoor weather. But if the flag is cotton, polyester, or any kind of blend with those fabrics, you can use your choice of HTV. Please help!!! I have wrestling shorts that are 100% polyester. I have pressed on 270 and the vinyl is not sticking at all!!! I have decreased the heat and have increased with no success. Please tell me what I am doing wrong. Hi Jeannine! If your pressing time and temperature are accurate and the HTV won’t stick- pressure is usually the culprit. I’d suggest using a heat transfer pillow or mouse pad inside the leg of the shorts to counteract the seams as well. Hi! Is there any way to apply HTV to a latex or silicone swim cap? Hi Erika! Consistent exposure to chlorine can shorten the longevity of HTV, causing it to become brittle and crack. To decorate swim caps with the best results, I’d suggest looking into screen-printing inks. I wanted to do the same thing. Have you tried it with a silicone cap? Did it work? Hi Mindi! Unfortunately, Heat Transfer Vinyl doesn’t like to stick to silicone for long. I’d recommend screen printing for the most durable print. I have a blanket that someone wants me to add glitter htv to. It’s 100% polyester and the tag says you can use an iron but it also says hand wash only maximum temp 40 degrees Celsius. Am I even able to add htv to this? Hi Mandy! This is one of those cases, where’s it’s hard to say without testing the fabric first. I’d suggest test pressing a small area at 270-280°F for 15-20 seconds to see how the fabric will react. It’s likely that you can add HTV to the blanket, but you’ll want to press the fabric first before committing to the decoration just to be safe. I have a customer who has a jacket he would like HTV on. It’s 100% taslon nylon shell w/microfleece lining & lightweight polyfill insulation. Which type of HTV would be best for this and at for what time and temp? Hi Pam! If you’re decorating the nylon shell, then you’ll need to use EasyWeed® Extra in order for the HTV to stick. But you could use any HTV on the fleece lining. Since nylon and fleece can be heat sensitive, you may want to err on the side of caution for your customer and press between 270-280°F for 15-20 seconds to ensure the fabric isn’t affected. Hi there! I’m needing to press superhero capes. They’re 100% polyester- SUPER thin material (think plastic table cloth type but NOT plastic). I’m putting easy weed on. Suggestions for temp and time? Thanks! Hi Tiffany! With thin polyester like that, it’s likely the material is heat sensitive. I’d suggest using the lower application method, 280°F for 15-20 seconds. If I am making custom nylon lanyards, it appears I should use easy weed extra. How does it stick? Do I still use an iron? Thank you! Hi Vickie! Yes, if you’re decorating nylon you’ll need to use EasyWeed® Extra for the HTV to stick. Extra cuts, weeds, and applies the same as regular EasyWeed, however Extra has an especially strong adhesive that’s made to grip nylon and coated fabrics. Hi… would easyweed work on a barber cape that is durable polyester (plastic to me)? I am curious of temp and any tips as I would hate to ruin it. Thanks! Hi Natalie! Yes, you can put heat transfer vinyl on salon capes. If the fabric is polyester, I’d go with regular EasyWeed®, but apply it using the lower temp application method (270-280°F for 15-20 seconds) just in case the fabric is heat sensitive. Often, barber capes are nylon though. In that case you’ll need to use EasyWeed Extra for the HTV to stick to the fabric. Hi- can I apply HTV to a jacket that is 85% polyester/15% nylon? Thanks! Hi John! Yes, HTV can be applied to a polyester and nylon blend jacket. However, since the jacket contains nylon you’ll need to use EasyWeed® Extra. Otherwise the vinyl will not stick to the slick surface. Hi what kind of vinyl I have to use on a 100% polyester? Hi there! All Siser® HTV can be applied to 100% polyester. I am having an issue with the HTV coming off in the wash on shirts that I pressed and I am hoping you have a suggestion. The shirts are 100% polyester with Easyweed stretch and electric that was applied with a heat press at 280 degrees. I tacked the first 2 colors at 5 secs each and the final press with third color at 15 sec. 2 of the shirts left scorch marks and after washing the other 3, the vinyl came off. I thought about a final extra press of 15 sec, but the scorching on the others had me concerned. Thanks for all the great help you provide!!! Hi Mindy! We often find when the application time and temperature are suitable and the HTV is lifting, there’s a problem with pressure. I’d recommend pressing the shirts with heat transfer pillow inside- watch this video to learn all about pillows. EasyWeed® Stretch needs firm pressure to prevent peeling. Additionally, it sounds like the fabric is extremely heat sensitive, so you could even go down to 270°F for the temperature. Thanks so much. Will give it a try with your suggestions! What psi readings correspond to light, medium and firm to make sure I have it right? 1-3psi is Light, 4-6 is Medium, and 7-9 is Firm pressure. Good luck! I have a shirt that is 90% polyester and 10% elastane. “low iron”. Would it be best to press on the 280* for a longer time? and since stretchy which htv would you suggest? Hi Alicia! Yes, if it says “low iron then I’d definitely go with 270-280°F for 15-20 seconds. EasyWeed® Stretch will perform the best on the elastane, but be sure to use firm pressure and maybe even a pressing pillow if needed. alright, the vinyl on my leather jacket has been peeling for a long time, and i would like to repair it, but i dont have a heat press or teflon, i do have an Iron and a Pillow case. and i do know I used easyweed. though i think it was easyweed extra? whichever one works on leather. Hi Will! EasyWeed and EasyWeed Extra will apply to leather, however real leather can vary in the amount of natural oils that get released over time. Sometimes these oils will prevent HTV from sticking properly. To re-apply the HTV on your jacket, I’d suggest turning your iron to a setting or two below “Cotton” and pressing with the pillow case on top for 5 second increments until the HTV is adhered again. What temp for 100% polyester? And wind breaker material? Hi there! Sometimes polyester is heat sensitive and sometimes it isn’t. I’d recommend test pressing a small inconspicuous area with the recommended settings for the HTV you’re using (time, temp, and pressure can be found on each product page of our website) to see if there are negative effects from the higher heat. If so, you can lower the temp to 270-280°F and press for 15-20 seconds for all Siser heat transfer vinyls. Windbreakers can be polyester but are also sometimes nylon. If the fabric content has any nylon you will need to use EasyWeed® Extra in order for the HTV to stick. You may also need to remove a waterproof coating from the application area if the HTV still isn’t sticking. Check out this video for more details. Htv siser works on silk satin? Hi Sara! Yes, but satin can be heat sensitive so you’ll want to use the lower temperature application method to avoid harming the fabric. Can you put easyweed on a Polyvinyl Chloride bag using a heatpress? Hi Joy! Yes, but I would definitely recommend using the lower temp application method to avoid melting the bag. I have a baby milestone blanket and it says it’s 100% Flannel. It’s that soft plush blanket feel. Would it be best to use Siser Extra or Stripflock? Also would I use the heat sensitive settings? I have a FrancierStudio heat press. Hi Donna! Flannel is often cotton or wool, so you won’t need to use EasyWeed® Extra which is designed for nylon fabrics. Additionally, the standard heat settings shouldn’t be a problem for that fabric, so I’d go with StripFlock®. Would the siser heat pillow prevent scorching on material? For example i want to press on a tube top, i have experimented with 270-280° but that may be a lil too hot for certain materials. Hi do you know if Siser HTV can be applied to shirts that are poplin? Like Columbia type fishing shirts. They most often have that mesh lining underneath. I’m using a heat press and I’m not sure about this fabric type. Hi Desiree! Poplin is a cotton fabric, so you can use any Siser® HTV with their recommended application settings. Hi Lily! I am looking for advice on applying vinyl to a patterned faux leather notebook. I have a cricut heat press as well. Hi Cindy! I would try setting your Cricut EasyPress to 300°F and press in 5 second increments until the carrier releases all the HTV. Be sure to use a cover sheet of some kind to protect the faux leather. I am customizing a bathing suit that is 80% nylon and 20% spandex. I know I can use print and cut extra but can I use glitter for the number and name? Hi Renita! For a nylon blend you’ll need to use ColorPrint™ Extra or EasyWeed® Extra as your bottom layer for the Glitter HTV to stick. Please keep in mind that Glitter HTV won’t stretch with the spandex and may pucker or crack if the design is large. Just found this. 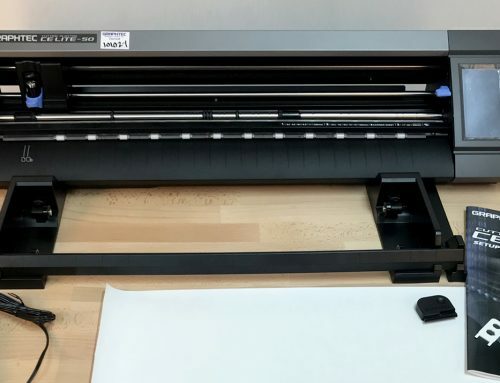 I have a Mutoh ValueJet 426UF (small UV printer) is it possible to print with the UV printer on the material and afterwards transfer it to textiles like t-shirts, or is this only for solvent printers? Hi! Siser® ColorPrint™ materials are only compatible with eco-solvent, solvent, and latex inks. So unfortunately, UV printers will not work with our products. Hi Kaitlin! Heat Transfer Vinyl comes on a clear plastic carrier and Siser® adhesive vinyl, EasyPSV™, comes on a paper backing. Another way to tell the difference is to peel up a small corner and feel the back of the vinyl. If the vinyl is already sticky, then it’s adhesive vinyl. If the adhesive side of the vinyl isn’t sticky it’s heat transfer vinyl (the adhesive is activated by the heat when applied.) If EasyPSV™ was heat applied, it could possibly melt and wouldn’t stick to the garment because the adhesive isn’t formulated for fabrics. Hope that helps! Hi Carrie! I’m so sorry for your experience with EasyWeed® Stretch! To assist you best, please send your heat application process (equipment, time, temp, and pressure used) as well as any photos of the lifting HTV to Support@SiserNA.com so we can help troubleshoot this situation. Thanks! Hello! I just cam across this post as I am doing a little bit of research! I was going to purchase a polyester taffeta sort of windbreaker jacket and wanted to put HTV on it but I don’t want to melt the jacket! Any suggestions? Hi Anna! I’d recommend using the lower temperature application method for polyester taffeta: 270-280°F for 15-20 seconds. You may also want to watch this video and check if your jacket has a waterproof coating which will affect the application process. Hi! I have EZweed Extra. Is this suitable for a hat 80/20 acrylic/wool OR 50/30/20 wool/acrylic/nylon? Hi Rachel! You can use EasyWeed® Extra on those blends, but EasyWeed® is going to be a more cost effective choice for the project. If you only have Extra on hand then go for it, otherwise I’d suggest purchasing standard EasyWeed®. Hi! I would like to use htv on dog collars made of nylon webbing. I’ve tried the easyweed extra (heatpress set to 305 F for 15 seconds), but the vinyl comes off in the wash. Just wondering if I’m doing it wrong, or am I expecting too much? Hi Traci! Some nylons have coatings that prevent the HTV from adhering properly. However, we’ve had success on nylon dog collars in the past. I’d suggest testing out another brand of collar to see if you have better results. Hi! I would like to personalize my daughter’s gymnastics apparel (like Ozone leotards). I have used EasyWeed Stretch on one before and it held up pretty well. I would like to have a metallic finish on her leotard, but I am not sure if the Metallic HTV would bond well with a fabric with a high lycra content. I would also be able to layer the shiny HTV is that possible? Thank you! Hi Adrian! If the satin jacket is made of nylon then you’ll definitely need to use EasyWeed® Extra. If you only have 1 garment, I’d suggest pressing at 280°F for 15-20 seconds with medium pressure. Sometimes satin and nylon can handle the standard 305°F temperature though, so if you do have an extra to spare I’d suggest test pressing in an inconspicuous area for 10-15 seconds to see how it will react first. Hi. I want to put HTV on 65% Polyester & 35% Viscose. Is this possible and what heat setting should my heat press be? Hi Maresha! Viscose is similar to rayon and can be decorated with heat transfer vinyl. I’d recommend using the heat application settings from this post on decorating rayon. Can you put glitter htv to a jacket with 84% polyester and 16% elastic? Hi Becky! Yes, you can however please note that Siser Glitter® HTV may not stretch with the elastic and if the jacket has a waterproof coating, you may need to remove it. Check out this video for how to identify waterproof coatings, remove it, and recommended heat application settings. Hi Anna… baseball coach from Ohio, doing warm up They are 100% matte micro polyester. I have HTV logos, names and numbers. From what I am seeing, 170-180 for a couple seconds to get the backing off, followed by 15-20 seconds following. with the heat transfer paper on top both times… is this the correct procedure. Hi. I used Siser Easyweek Stretch HTV on Cotton stretch headbands for my daughter’s soccer team. I pressed with an Easy Press 305 degrees for 15 seconds, but it was not long enough for the team name so I upped it another 15. It still seems like it is not fully adhered, and doesn’t lie flat when stretched. What did I do wrong? I am going to try pressing again, but I was afraid of pressing too much. Any insight? Thanks! Hi Kelly! Some headbands have a seam or stitching that runs through the center. If that’s the case, you’ll need to put a heat transfer pillow inside to even out your pressure. Otherwise, I’d recommend increasing your temperature to 335°F and press each section of vinyl firmly for 10-15 seconds until it all releases from the clear carrier. Hi! I am wondering if you could perhaps have advice on using htv on an easter basket that is lined with plastic, but I don’t know which kind. The fabric on the outside appears to be cotton, but I don’t want to melt the inner liner, which I can’t see. I thought about using either an iron or my flat iron, but I don’t know what temperature. Any suggestions? Hi Tina, if you can isolate the heat from your flat iron to just the fabric area and avoid the plastic, I think that would be the best route. Sometimes flat irons/hair straighteners have temperature settings like in this post on decorating headbands. In that case, a setting around 300-320°F will be best. If your flat iron just has number settings, then I’d suggest starting low and increasing the temp until all the HTV releases from the carrier. If the clear carrier begins to shrivel or wrinkle, then you know your heat is too high. Good luck with your project!